Beyond Fest, the for fans by visionary fans genre film festival kicked off Thursday night with the L.A. premiere of the new Daniel Radcliffe flick, Horns. Friday night saw The Egyptian Theatre screening no less than three films in one evening, two in the big house and one in the redubbed El Rey Theatre, usually known as The Spielberg. Giant lines had formed in the courtyard for the L.A. premiere of Nightcrawler, the Jake Gyllenhaal starrer and directorial debut of writer Dan Gilroy (Freejack, The Bourne Legacy). The Egyptian was decked out in an array of impressive event banners and posters along with a stand for Death Waltz Records selling limited edition vinyl soundtracks and concerts. After catching up with Beyond Fest founder and Dammaged Goods ally/mentor Christian Parkes, we took our seats as the place filled up to capacity. Sat in front of us was one Edgar Wright which made me wonder who else might be in the crowd tonight. American Cinematheque programmer and Humans From Earth producer Grant took to the mic along with Mr. Parkes and the two rattled off welcomes and thanks for their crazy 2 year old baby known as Beyond Fest. Screening something like 30 films in under 2 weeks, 9 months of preparation was finally leading to fruition and at last glance, more than a few nights have sold out. Robert Rodriguez's El Rey Network sponsored the event so half a dozen screenings were free. Apparently you can submit your artwork and short films to the channel for possible broadcast and compensation! Tonight's happening was co-produced by Jeff Goldsmith and his screening/interview series/podcast Backstory. After a few trivia questions, it was time to roll the flick which I've only heard good things about. Luckily, all of the pre-hype was spot on as Nightcrawler is one funny, fucked up and creepy movie. Right away we meet Lou Bloom (Gyllenhaal), a seemingly nice yet odd young man with a propensity for violence. Lou sells himself to every person he comes into contact with using a mix of straight forward moxie and internet facts yet learns a little something from each encounter or job rejection dealing with a real person. A life of petty thievery is going nowhere and one night he happens upon a car accident on the highway. Pulling over just in time to watch two cops pull a woman from a burning car, another vehicle pulls up and out hops Joe Loder (BILL PAXTON), a stringer/nightcrawler who video tapes the incident to sell to the local news station. Inspired, Lou gets himself a cheap camera and police scanner and gets footage of a shooting. He then sells the footage to local News Director Nina (Rene Russo) and the once murky future becomes suddenly clear. Lou picks up a seemingly slow witted employee named Rick (Riz Ahmed) and the duo chase down gory incidents involving the affluent population that suburban viewers will eat up nightly. Hungry for success, power and notoriety, Lou begins to leverage his position with the network while making several morally questionable moves to get footage. With the movie still a month from release, I won't get too deep into the flick other than to say it's pretty Damme good. 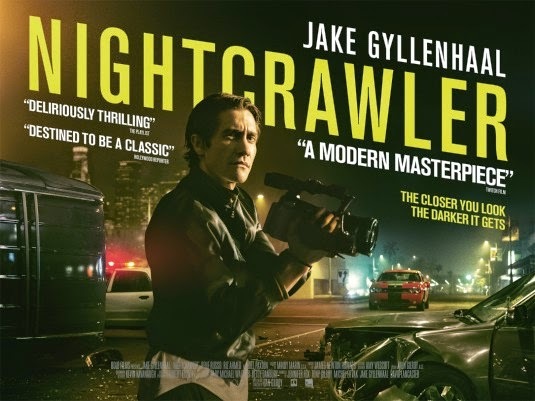 I've never been much of a Gyllenhaal fan but after Prisoners and now Nightcrawlers, there's no denying his talent as an actor. Losing 30 pounds to play the gaunt Lou Bloom, his wide eyed stare becomes incredibly creepy. We don't get much backstory on Lou but know he spends a lot of time on the internet and is a loner. That leads to his awkward social behavior which kind of reminded me of Quentin Tarantino and how he spent several years out of school just watching television and that shaped him into the movie loving yet odd personality that he is today. In a sense it also reminds you of Jim Carrey in The Cable Guy where the television was his only friend so he yearns for something real and that desire becomes darkly twisted. Gyllenhaal's performance is somehow a seamless blend of boy next door/door to door salesman/creepy stalker. Writer/director Dan Gilroy does a phenomenal job in his directorial debut as the flick looks fantastic thanks to D.P. Robert Elswit (Boogie Nights, The Town) and is remarkably efficient, laugh out loud funny, visceral, intense and educational while reflecting on but not condemning a society that rewards amorality in favor of capitalism. Music by James Newton Howard (Batman Begins, Macrotus anyone?) is ambient yet powerful and fits the movie perfectly. - Father is a Pulitzer Prize winning author, wrote in his pajamas all day which inspired Dan and his brother Tony (The Bourne Identity series). Biggest fan and harshest critic. - Writes 7-10 hours a day, thinks about an idea for a while, outlines, researches then sits down to write. Doesn't get writers block because by the time he's sat down, he's very passionate. - After thinking about Nightcrawler for a couple of years, banged out a script in a few weeks. - Went out with real nightcrawler with Jake to prep, racing around Los Angeles, visiting an accident site, at first repulsed but then admired professionalism of it. - Upset how State of California has let film production, one of the most lucrative, exciting and exportable products in the world, go out of state and country. - Nightcrawler was one of 32 films selected by lottery out of 400 that applied for California Tax Incentive program. - Gives massive credit to Gyllenhaal for making Lou such a rich character on screen. Role is hero/villain/anti-hero,etc. Met on Atlanta set of Prisoners where Gilroy pitched movie to the actor over a 4 hour dinner. - Created a viral video to post on Craigslist, people thought it was real and was offered two jobs. - On being a new director, controlled content which was star appealing and low budget so never any discussions of giving to a more established name. - Brother John edited the movie, let him know what inserts to get, Dan and guerilla crew went back at least 5 times to get necessary insert shots. - Wrote the first draft of Real Steel which was then altered heavily through development process. Had to go to arbitration even though he'd never even seen the Richard Matheson material it was allegedly based on. It was a late but fun night. The movie, crowd and panel were great. Really impressed with the scope and presence of Beyond Fest and excited for those directly involved that their efforts have been met with so much success. See you Wednesday for Halloween with John Carpenter and Jamie Lee Curtis!